33-year-old woman presents with 3-year history of slowly growing nasal tip lesion biopsied as a trichoepithelioma. Mohs excision was performed creating a 0.6 cm defect. It was reconstructed with a lateral nasal island flap. Figure 1. 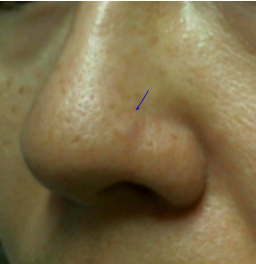 Trichoepithelioma of the left nasal tip. Trichoepithelioma is a benign basaloid follicular neoplasm (arising from a pilosebaceous unit). Its basal cell proliferation is differentiated from basal cell carcinomas by the lack of classic BCC features such as prominent cleft retraction, myxoinflammatory stroma, significant mitotic activity, cytologic atypia, and tumor necrosis. It arises most commonly in the head and neck. Treatment is necessary due to its progressive growth. Trichoepitheliomas are most commonly sporadic, presenting as a single lesion. Desmoplastic trichoepithelioma (DTE) variant is more unusual and has worrisome histologic features. It mostly presents in the faces of young to middle-aged women. Morphologically, it mimics morpheaform basal cell carcinomas and has invasive nature. Multiple familial trichoepitheliomas (MFT) is an autosomal dominant condition presenting classically in nasolabial folds, paranasal skin, and medial eyebrows creating an X-like distribution of cutaneous papules. (see figure 2.) A phenotypic variant of MFT is Brooke-Spiegler syndrome that presents with multiple trichoepitheliomas and other adnexal tumors such as spiradenomas and cylindromas. These tumors can be disfiguring and functionally impairing. Figure 2. Example of multiple familial trichoepitheliomas distributed in an X-shaped pattern. Solitary lesions can be treated with laser ablation, cryoablation, and needle electrocautery. Surgical excision is the most common treatment of trichoepitheliomas. Mohs excision is the preferred method especially for the invasive desmoplastic trichoepitheliomas (DTE). Topical imiquimod and tretinoin have been described from treatment of multiple lesions. Differentiating isolated trichoepitheliomas from basal cell carcinomas does not change the surgical treatment plan for most patients. However, knowledge of the diagnosis of trichoepithelioma reduces the time-pressure for treatment and affords consideration for alternative treatment techniques. In our patient, we treated her with Mohs excision and the lateral nasal island flap for reconstruction (see figure 3). Figure 3. Final Mohs defect of 0.6 cm followed by lateral nasal island flap reconstruction. Final aesthetic outcome 3-months post-op. Figure 4. 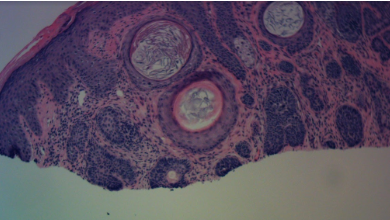 Histology of trichoepithelioma.